Another event like that. This one a little closer to me. 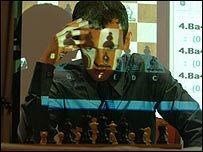 Rustam Kasimdzhanov vs The Accoona Artificial Chess software in NYC. NEW YORK, May 24 /PRNewswire/ -- Accoona Corp., http://www.Accoona.com , the Artificial Intelligence Web Search company, announced today it will present the ultimate Chess Event in the heart of Times Square NYC on June 21, 2005. The "Man vs. Machine" chess match will be played at the ABC Television Network's Times Square Studios, 5pm, June 21, 2005. The Accoona Artificial Intelligence Search ToolBar, with its powerful Chess software program, will face the officially recognized World Chess Champion Rustam Kasimdzhanov. The event is sanctioned by the New York City Sports Commission, the US Chess Federation, and the Association of Chess Professionals. Has anyone heard of this Acoona software? Mike, if you can take pictures, would you send them to me please? Anything else? Autographed Resurrection manual or Hydra baseball cap? The six game chess match, will take place at the Wembley Centre in London on 21-27 June, with a purse of $150,000 (�80,000) up for grabs. I wish I could be there to watch this! Also, there's quite some handsome money involved here. Expect a master class in anti computer chess. But whether Mickey is strong enough to make an impression on Hydra I have no idea. I shall try and go to see at least one game if I can. A good chance also to see how the fantastic new Wembley Stadium is shaping up. It already dominates the skyline in that part of London.